The purpose of this project is to provide improved estimates of Louisiana wetland land loss due to hurricane impacts since 2004 based upon a change detection mapping analysis that incorporates pre- and post-landfall (Katrina, Rita, Gustav, Ike) fractional water classification of a combination of QuickBird, IKONOS and Landsat satellite imagery. This first data series report focuses on Hurricane Rita, which made landfall on the Louisiana/Texas border on September 24, 2005, as a Category 3 hurricane. The study area is an approximately 1961-square-kilometer area in the Chenier Plain that includes and is roughly centered on the Sabine National Wildlife Refuge. Comparison of the classified imagery demonstrates that water areas increased by about 10 percent between 2003 to 2006. This change is attributed to both permanent wetland loss as a result of the hurricane as well as temporary changes in the water-land configurations such as remnant flooding, the removal of aquatic vegetation and water level variations caused by tidal and (or) meteorological variations between the acquisition dates of the satellite images. 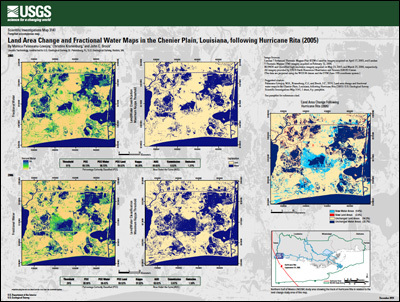 Palaseanu-Lovejoy, Monica, Kranenburg, Christine, Brock, J.C., 2010, Land area change and fractional water maps in the Chenier Plain, Louisiana, following Hurricane Rita, (2005): U.S. Geological Survey Scientific Investigations Map 3141, 1 sheet plus 6 p. pamphlet.